The original Skagit Queen , built in 1898. From a photo of the late Howard Miller's collection. Capt. H.H. McDonald and wife, photo with story. 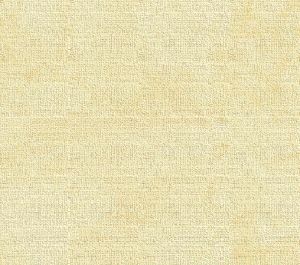 Please excuse condition, a copy of the newspaper copy. Water transportation between Mount Vernon and Seattle had its permanent establishment back in the early 1890s. Coming to the Sound with the Clan McDonald, which he had built on Gray's Harbor, Capt. Henry H. McDonald [1857-1924] placed the boat in service on the Seattle-Skagit run. That was the founding of the Skagit River Navigation Company. It is related in old publications how Capt. 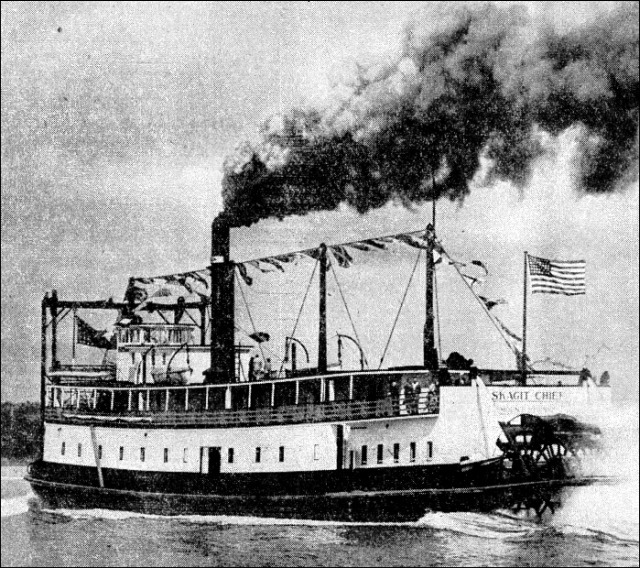 McDonald had a 15-year fight with James J. Hill, president of the Great Northern [railroad], in which the Empire Builder came out second, finally yielding after discovering that the boat service was getting the bulk of the business. For many years after its establishment McDonald's company enjoyed a large passenger traffic in addition to freight business. The dock, which was at the foot of Gates Street, was the most interesting and exciting place in town when the boat arrived. People would flock down to the dock to watch the boat tie up and discharge its passengers. Of late years, due to the automobile, the service is entirely devoted to carrying freight. Following the Clan McDonald were the Mabel, Henry Bailey, Multnomah, Elwood, Skagit Queen, Gleaner and Harvester. At the present time the company has in service the Skagit Chief on the Seattle-Mount Vernon run and the Stanwood, which runs between Seattle and points on the west side of the Sound. The personnel of the company today is Anna G. Grimison, president; Mrs. Charlotte Skondal, secretary; Mrs. Clair Syliasen, treasurer. All three are daughters of the Captain, of whom Mrs. Skrondal resides in Mount Vernon. By Noel V. Bourasaw, Skagit River Journal Oddly, none of the available records indicate when Captain McDonald first appeared on Puget Sound. Luckily, we have a first-hand record my Nina Cook, Mortimer Cook's daughter, in her diary that she compiled while living in the family cottage at Old Sedro: "Sept. 1, 1886: We went up yesterday to Lyman with Capt. [Henry H] McDonald on the Gleamer." 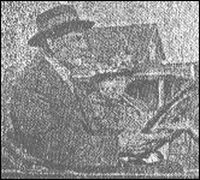 By 1900, he was operating the sternwheelers Elwood and Skagit Queen. The Skagit Queen was built for McDonald at West Seattle in 1898, just before he incorporated as the Skagit River Navigation & Trading Co. She carried 318 tons, was 125.5 feet in length, with horizontal engines 12 x 72 inches. www.Cimorelli.com, a tremendous source for old boats and ships of all kinds, explained that the machinery and housing were from the steamer City of Champaigne (formerly the Henry Bailey) and actually only the hull was of new construction. Gordon Newell, also author of key maritime books, informed readers of all shipping from the annual Maritime Events of xxxx, series of the 1890s and early decades of the 20th century. He reported the sad end to the Skagit Queen in his 1912 volume: "Skagit Queen (steamer) The Seattle Packing Company had earlier attempted to convert the Skagit Queen to a floating cannery, the old sternwheeler having been replaced by the new Harvester, Her hull was found to be too unseaworthy and the Amelia was substituted and became a floating cannery. Unfortunately we do not know the details of its fall. McDonald not only fought with Great Northern, but he also jousted with the Greyhound group. He finally sold two ships to them, for the small fleet captained by George S. Barlow. His company thrived, though, even after his death in 1924. His daughters, Mrs. Anna Grimison and Mrs. Charlotte Skrondal, both became captains in their own right. Anna was the most famous, becoming associated with the character Tugboat Annie, in the eponymous movies. She was part of the promotion team for the 1940 sequel, with Hedda Hopper along to build up the listenership and co-star Ronald Reagan also accompanied them. She piloted a Skagit Queen II along the way. We have not yet discovered when the company went out of business but we know that Skagit Queen II was in operation from 1934-56. 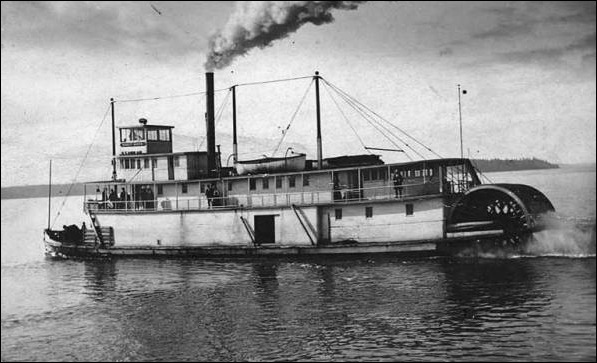 The Skagit Queen II, in a photo that accompanied the story. It was in service from 1934-56. Our early profile of the centenarian, Joshua Green, who was a pioneer of steamboats, ferries and banks.